They came, they saw, they conquered and then left is the simplest way one can describe the international men's and women's friendly matches between Kenya and Uganda at the Nyayo Stadium gymnasium on Friday night. While Uganda women whitewashed their Kenyan counterparts 80-57, their male compatriots finished the job by hitting the home side 62-56 in a tough match which could have gone either way. Kenya Basketball Federation top brass was not happy that Kenya lost in all the three friendlies played in a span on three days at the fully packed Nyayo facility. Kenya men lost 66-49 to Cameroon at the same venue on Tuesday. However, a lot of positives can be gained from the international fixtures. The federation plans to keep the national teams busy ahead of international competitions next year. 'This is the first time for example the Kenya men's team is playing a friendly match since 1994, and more of such fixtures makes me believe that Kenya can go far," said Peter Orero, KBF treasurer. Against a 10-member Uganda, the Kenyan women just like their male counterparts were a disjointed lot, playing without purpose as their opponents dictated the pace. Belinda Okoth (190-C-87) and Melisa Akinyi had scored four quick baskets as Kenya led 8-02 But that was the best they could do as Uganda took command with Ritah Imanishimwe (165-G-96) and Martah Soigi doing much of the damage. JKL Dolphins celebrated NBL title. 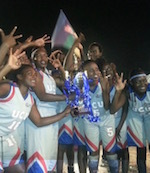 They topped UCU Ladies to win the championship series. The hosts trailed by 2 points after three quarters before their 20-15 charge, which allowed them to win the game. JKL Dolphins forced 20 UCU Ladies turnovers. Strangely UCU Ladies outrebounded JKL Dolphins 48-35 including a 38-25 advantage in defensive rebounds. Forward Hope Akello (-97) fired a double-double by scoring 10 points and 10 rebounds for the winners. International guard Ritah Imanishimwe (165-96) chipped in 15 points. Five JKL Dolphins players scored in double figures. 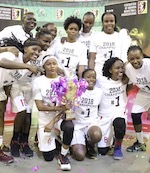 Kenyan center Vilma Achieng (-94) produced a double-double by scoring 22 points and 12 rebounds and international forward Sarah Ageno (176-96) added 13 points and 10 rebounds respectively for lost side.